What an amazing weekend I had. As I am writing these lines, I am coming back from the Wine Bloggers Conference, where I had the chance to meet some of the best, la crema de la crema from the wine blogging industry. Even though, I did not know anybody, I felt warmly welcomed in this wine fraternity. Saturday was an amazing day. I had a chance to participate in a Rias Baixas seminar led by Lyn Farmer. Rias Baixas wines are not new to me. When I was living in Madrid, my roomate Pedro’s family had family living in Vigo, that how I first came to be in contact with the wines of Rias Baixas and got to know Albarino. Lyn Farmer is a wonderful, witty and with a terrific sense of huour guy. He is James Beard award winning wine and food writer, who do a lot of cool things including blogging and giving courses for the Wine & Spirit Education Trust ( WSET). He also directs tastings for VinItaly, the Italian Trade Commision and Sopexa. Through a tasting of 10 wines, I got to learn the styles of Albarino in Rias Baixas. There are 5 subzones in Rias Baixas: Ribeira do Ulla, Val do Salnes, Soutomaior, Condado do Tea and O Rosal. Galicia, the green Spain is the home of these subzones. Here the climate is very similar to the Loire Valley and New Zealand. It is heavily influenced by the Atlantic Ocean. This is a fairly cool area that gets heavy rain through the year. However, what saves them is the 2,200 hours of sunlight that is received during the ripening season of Albarino. The soils are heavily granite based with a combination of clay, silt and gravel that is on the top soil. Here are some of the key interesting things that i learnt from the presentation. Galicia is famous for its seafood, including percebes and Oysters. No wonder Albarino has an affinity with seafood. Like Lyn said, what grows together go well as well. Albarino wines have a diverse palette of aromas. These include honeysuckle, citrus fruit, melon, peach and lots of flowers!!! The DO is fairly recent going back to the mid 1980’s but winemaking has been ocurring since the 13th century. Extented contact with the lees. The Barrel technique is gaining momentum in Galicia and adds more structure and complexity. However, is a bit of an adquired taste that needs time to be appreciated. Barrel ageing is only used in special vintages where the fruit is very ripe. Lees contact is also on vogue in Rias Baixas. The lees is what gives the creamy aspect to the Albarinos and also contribute for flavor development as well. Rias Baixas Barrica-wines aged in oak, either red or white. Rias Baixas Tinto. -red wine that counts for less than 1% of the production. We started off tasting the Martin Codax Albarino 2016. This is a cooperative that was founded in 1986 and count with 50 local grapegrowers. The wines of Codax are sold in over 40 countries in the world including Canada. This Albarino for 3 weeks was fermented in stainless steel and 15% of the wine saw malolactic fermentation. A lovely nose that brings to mind melon, granny smith apple with notes of dry thyme and pencil lead. Crisp and medium body, it had a good amplitude and nice creaminess sensation in the palate. Next was the Valminor Albarino. This is the brainchild proyect of Carlos Gomez who established the winery. One of the cutting edge bodegas in the region. This wine a shorter alcoholic fermentation than the Codax and a cold maceration for 6-8 hours. A very different wine with notes of white peach and yellow apple character. Less creamy with a marked saline and floral character. The next wine was from Bodegas As Laxas. This is the winery of Simon Ferro, who was one of the founding fathers of the Regulation Council of 1986. The Albarino fruit is very old ( 30+ ) and the vineyards are planted on south facing terraces between 500 and 650 feet. This wine was displaying a more floral side of Albarino. It was rich, almost with an oily texture. It had also a very long complex finale. Further on with the Condes de Albarei. From the Salnes Valley, this is a wine made by a small group of vinegrowers. Albarei was the first wine to have won a gold medal at the Challenge International du Vin in Bordeaux. Today, they are a benchmark in the appellation. This wine was fermented with wild yeasts for a short but sweet 10 days alcoholic fermentation at controlled temperatures. The use of indigenous yeast gives this a very nice core of spices such as mustard seed with intruiguing floral notes ( acacia and jazmin comes to mind). It also has a delicious saltiness that envelops your mouth. One of my favorites at the seminar. Beyond Albarino the other grapes used in the appellation include Loureiro, Treixadura, Godello and Caino Blanco. We saw an example of assemblage in the Santiago Ruiz 2016. Next in line was the Fillaboa Albarino. Low temperature fermentation and lees aging. A very distinctive nose bringing to mind chamomile, gunflint and ripe Ontario peaches. Linear and chalky with notes of wild fennel. To continue, we tasted the Terras Gauda O Rosal 2016. Terras Guada is part of a boutique winery group founded in 1989. They are specialists in working the indigenous varieties of Albarino. In a lavor of love, they rescued the ancient variety Caino Blanco. The Rosal is a blend of 70% albarino, 18% Caino Blanco and 12% Loureiro. The wines do a cold maceration in tank and spent 3 months on its lees. A very special wine with lots of depth. Honeysuckle, dry oregano and japanese pear comes to my mind. Creamy and very fresh. From Pablo Padin, i enjoyed tasting the Segrel Ambar 2015. A careful selection of Albarino from the Salnes Valley. A very floral wine bringing to mind wild white roses, anis and wild fennel. Exhuberant and very aromatic bringing to mind a Riesling. Pazo de Senorans was next. This is a wine that is quite available on the Canadian market. A family business that specializes in Albarino. The winemaking is simple. Alcoholic fermentation at controlled temperatures with short pellicular maceration before pressing, 5 months aging on lees. An amazing wine displaying vervena, wild green mint and a great minetality. Linear with a lot of poise. Lagar da Condesa was the latest wine of the seminar and if you can guess, the one with the barrel aging. The winery is located in Arcos da Condesa and is built on granite with a very modern technology. Rich and opulent with notes of wax, honey, dry apricots and brown butter. Concentrated but very elegant. So, what to eat with Albarino. These are wines that demand seafood for sure. The creamier wines will go well with fish. I am thinking salmon since i live in Quebec but also some salads with goat cheese for instance. This morning, I woked up with an incredible thirst to have a few bottles of Rias Baixas with Langosta a la Parrilla. Living in Quebec, soon I will be getting my fix of the queen of the crustaceans. When I think of eating Lobster, all I need is a nice Albarino. When made in the Galician wine region of Rias Baixas, often displays an echo of salinity from the nearby Atlantic, with different tones of floral notes, citrus, stone and tropical fruits. Plus, a Rias Baixas offers a very crisp acidity, medium body and low alcohol. Rías Baixas boasts a number of high-quality grapes. Albarino is king with a lion share of more than 90% of the DO’s vineyard area. It is said to be related to Riesling, and some wine scholars argue that it was brought to the area by pilgrims or monks on their way to the medieval town of Santiago de Compostela. Albarino is often blended with Treixadura or Loureira. The soils are mostly granite, with a little bit of chalk and clay. The bounty of the earth offers a stream of minerals with little nutrients, making it ideal for viticulture. The slopes encourage good drainage, a very important factor considering the high amount of rain, the area gets. The neighboring Atlantic Ocean provides not only rain but also humidity, so growers have traditionally favored trellising their vines with pergolas, allowing air to circulate around the grapes, therefore sanitizing the grapes. Fortunately, late summer is usually the driest part of the year, providing ideal ripening conditions for harvest in October. The grapes are pampered here. Bodegas Terras Gauda, are making some extraordinarily good wines from the local Rias Baixas grapes. 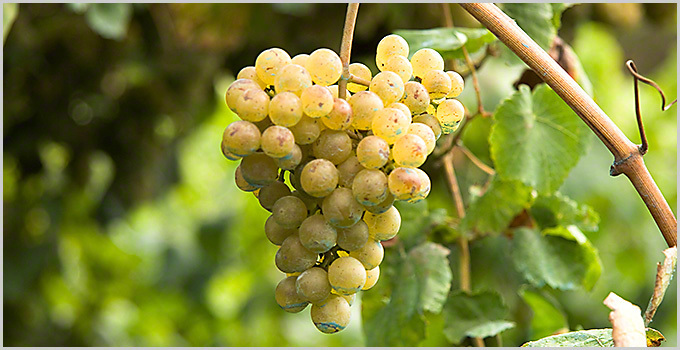 As well as famous albariño grape, they use loureiro (also found in Portugal’s Vinho Verde just a little further south), and intriguingly, they have taken the near-extinct caiño grape to their hearts,to preserve this disappearing local white variety. The 2016 is impressive on the palate due to its powerful structure. Youthful with a great character. On the mouth, it is quite aromatic and exuberant with citrus aromas of mandarin orange and grapefruit, ripe peach and pineapple, and additional nuances of orange blossom, mint and thyme. This is a serious wine for a serious shellfish. It retails for $24.25 in the Quebec market (10858351). If you cannot get your hands in a bottle of Gauda, try Albarino Valminor or Pazo de Senorans, they are good alternatives as well. 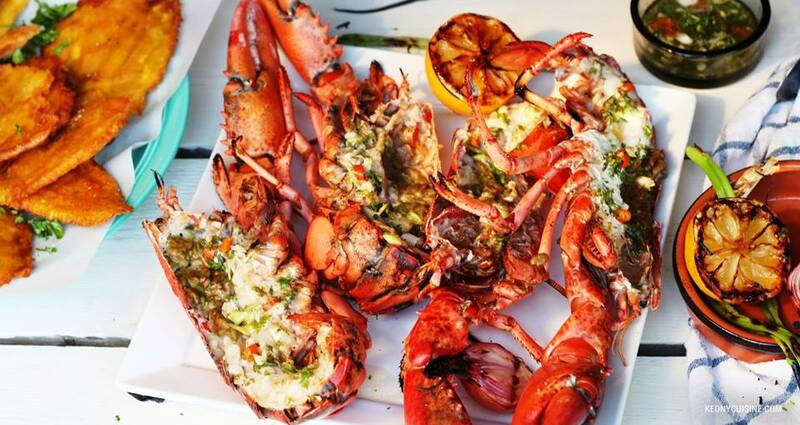 Lobster has a delicate flavor and should be matched with a wine which compliments and accentuates its sweet, succulent nature. That’s why I think a Rias Baixas is a natural partner: Imposing but not oververhemling. If you want to know how to grill a lobster, here is a very simple video that describes the task. It may seem complicate, but is quite easy. All you need is a good knife, a bit of dexterity and a nice lobster. Since my first visit to Rías Baixas back in 2003 have consistently loved its Albariño wines. While some of the wines are definitely better than others, I can honestly say that I have never tasted a bad wine. The Albariño grape is an easy grape variety to love. In my view it appeals both to the new or occasional wine drinker as much as it does to the exploring wine passionate. For my readers new with Albariño, it is a white grape indigenous to Rías Baixas. Its taste and texture, is like a crossover between the crisp, refreshing acidity and citrus aromas of a Riesling, with the stony fruit aromas of a Pinot Grigio, and a florality element that brings to mind a Viognier. This is the reason that it is must white wine that you must drink in 2016. It has a bit of everything. According to the producer, vintage and vineyard site, Albariño wines could be light to medium to full body. Most of them are made in the unoaked style, with some producers giving them oak aging and a new tendency is appearing to make orange wine from the grape. For some time now Galician winemakers have been experimenting with storing their Albarinos underwater. This practice has many advantages such as absence of light, a constant cool temperature, high pressure, and the gentle rocking motion of the waves.You can see in the video above this practice. This crew of TVE interviewed famed flying Spanish winemaker back in 2010. Albariño with fish and seafood are interwoven in the gastronomical culture of Spain have You wont go wrong if you serve Albariño with simple grilled or white fish, mussels shellfish, oysters and so on. It is also a good companion with Thai and Japanese cuisine. I also enjoy it with pastas in light cream sauce. Here are some Albarinos from Rias Baixas that I tried in the latest La Grande Degustation back in November. The wines come from the portfolio of Selections Oeno which has some very interesting producers in their portfolio. Very fresh nose. Simple but delicious minerality with peach undertones. On the mouth, medium body with a creamy texture and fresh acidity. Retronasal flavors remind me of dry chives, lemon zest and mountain herbs. The perfect wine for seared scallops and pasta. 93\100. Xion Rias Baixas 2014. D.O Rias Baixas. $19.80 CDN. SAQ Code: 12485543. On the nose, an emblematic that brings to mind white cranberries, plums with a hint of quince and green apple. On the mouth, very fresh with a marked minerality in the palate. Crisp with a fragant and aromatic finale. Must be lovely with jumbo prawns with fleur de sel. 93\100. Lovely nose that brings to mind fresh nectarines and apricots as well an underlying minerality. On the mouth, medium body. fresh and balanced with delicate white flowers flavors. White licorice, jazmin leaves come to mind. 93\100. Will pair nicely with mild Thai seafood dishes. Sittia Larantxa Orange wine 2014. Price: $29.25 CDN. Private Import. Selections Oeno. Sip on this-Albariño and Oysters. I recently was invited by a friend of mine to an Oyster party. This is the kind of venue, where a group of people ( 20 in this case ), get together for a debauchery on this mollusc. Since I rarely eat oysters, it was a magnificent opportunity to taste them and to stuff myself on them. Yes…, i am not shy to say that. Me, when it come to oysters, the spanish wine that comes to mind is Albariño. This white grape comes from Galicia, in northwestern Spain. It accounts for 90% of the grape production in the area. One theory regardings its origin, states that Albariño is related Riesling, introduced by German pilgrims on the path to Santiago de Compostela, a holy city in Galicia. Another expanation to its origin is that it was the Cistercian monks from Burgundy, who established vineyards wherever they built their churches, introduced it in the 12th or 13th century. While you may, once in a while , drink an albariño from Portugal called Alvarinho in poftuguese, the true home of the grape is Galicia in the Rias Biaxas appellation of northwest Spain. This terroir benefits from its proximity to the Mino River and more so, the Atlantic to the west which keeps the temperature cooler in the summer and milder in the winter than inland regions. While there are five subregions, the Condado do Tea and Val do Salnes tend to produce the best Albarino. Albarino grape (and wine), for me, is at its very best in the unadulterated form: unoaked and single variety. That offers the best of its true expression: clean, acid driven with lively citrus notes and refreshing minerality. I am a strong believer of wine and regional food. 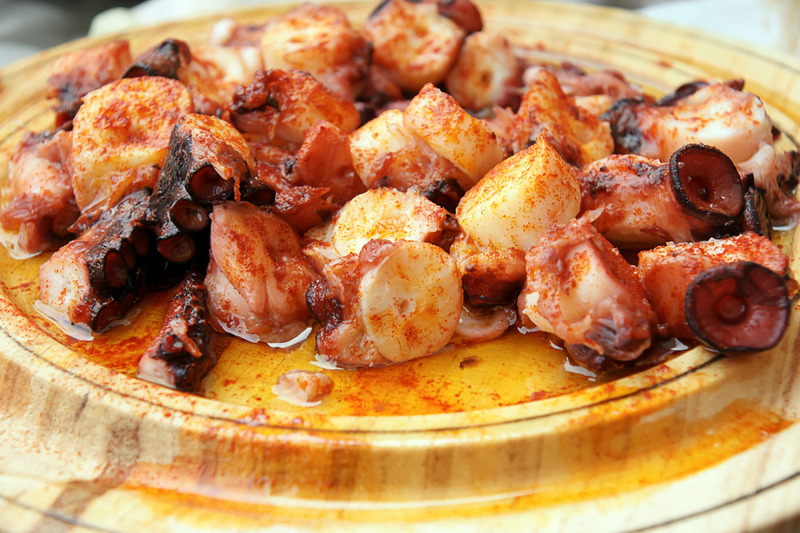 The heart of Albarino production lies on the northeast Iberian coast, the same region from which the majority fresh seafood such as crab, octopus and scallops is resourced. The spiny acidity, citrus profile and low alcohol content of Albarino is an ideal match for the sweetness of the seafood whether served whole, as a tapas, or accented with regional spice such as Spanish paprika (pimenton), or lemon, lemongrass or lemon verbena. With fresh seafood so abundant, it’s easy to dive into a tangy, citrusy dish of cerviche, fish crudo, or fresh lemon accented fish carpaccio of salmon or tuna. It is to die with our Canadian oysters. Fried foods love clean and refreshing wines to cut through the crust and Albarino is a wonderful pairing wines, especially if you’re looking for dry citrus notes. Asian dishes such as sushi and richer dishes such as seafood stew, casseroles of chicken, sausage and pork are fun pairings.